Davis McAnena with his proud parents Monica and Frank at the Kumon graduation ceremony at the Menlo Park Hotel on Thursday. Photo: Mike Shaughnessy. 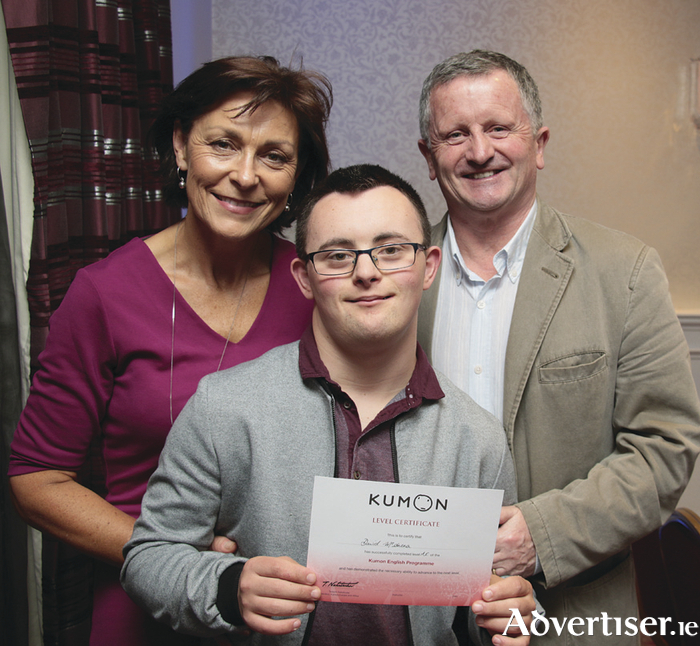 Excitement was palpable at the Menlo Park Hotel at the annual Kumon Galway City West Awards ceremony where families from every continent, and those native to Galway, convened. Deputy Mayor Cllr Mike Cubbard presented the awards. Opening the ceremony Cllr Cubbard spoke about how the Galway students proudly take their place among the millions studying Kumon worldwide. Kumon was set up to enable students of all ages and abilities develop and explore their full potential through individualised programmes in maths and English. Irene Murphy, regional director of Youth Work Ireland Galway, spoke of the similarities of Kumon and Youth Work in enabling young people take their place in the world. She announced the awards in the first two categories of the programmes. Cllr Noel Larkin, who as former Mayor of Galway city presided over the first annual Kumon Galway City West Awards, commented on the dramatic increase in the numbers present, before announcing the higher level awards, and the adult classes awards. Megan Casey, area manager, Kumon Ireland announced the Special Merit Awards, won by Hugh McDonagh and Naomi Adun, for exemplary commitment and perseverance, those qualities prized for the development of strong, capable people. She also announced the ultimate academic awards, two gold medallist completers, Jesna Johnson and Maria Thomas. These two completers have covered university entry level material in the English programme, more than three years ahead of their school level. For further information on Kumon study contact Denise Heneghan at 086 8285780, or email [email protected].